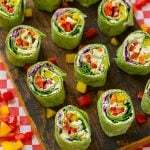 Rainbow veggie pinwheels are easy finger foods for families on the go and are perfect for home, school, or work lunches. Sometimes when I want a lunch that is easy to eat anywhere I make these veggie pinwheels with some homemade chex mix or some chips and a little container of this dill dip. Where has the summer gone? It feels like June was just yesterday and now today is our first day back at school! Along with the new school year comes the need for healthy and easy back-to-school lunch options. Turkey sandwiches can get kind of boring, which is why I have been working on some more creative ideas like these rainbow veggie pinwheels! 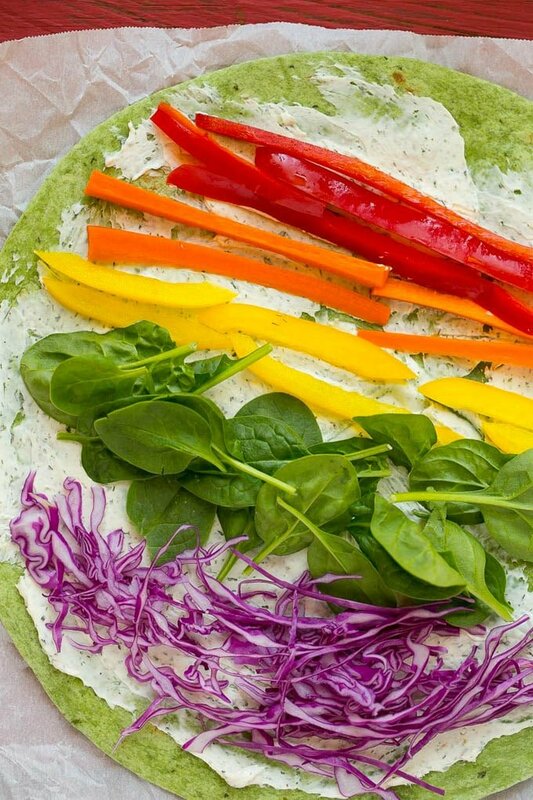 How Do You Make Rainbow Veggie Pinwheels? Let’s talk about how to make rainbow veggie pinwheels. I took a large tortilla, added a layer of ranch spread and then layered on a rainbow of thinly sliced veggies. I used red bell peppers, carrots, yellow bell peppers, spinach and shredded purple cabbage, but you could swap out for other colorful veggies if you prefer. Other great options would be broccoli, green beans, orange bell pepper, thinly sliced zucchini or yellow squash, or cucumber. Pretty right? You want to keep the veggie layers thin so that the pinwheels will hold together. The tortilla gets rolled up tightly and then sliced into pinwheels. My girls were thrilled with these, one of them said they reminded her of a veggie sushi! I used my homemade ranch dip powder for the spread but store bought ranch powder will work fine too. It works best to cut the vegetables into long strips; if you cut them small they’ll be more likely to fall out of the pinwheels. 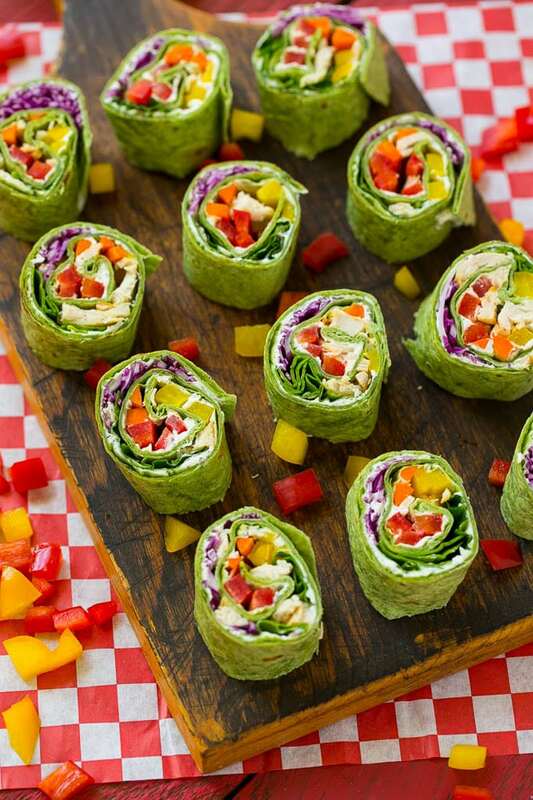 You can add a little shredded chicken or sliced deli turkey for extra protein if you prefer, but that’s totally optional and honestly I think these veggie pinwheels are pretty perfect as is. I’ve included a video that shows you just how simple it is to make the rainbow veggie pinwheels. Enjoy! Make Ahead: The pinwheels can be made the day before you plan to serve them. Little Helpers: The kids can actually make these themselves with your supervision, just give them a spoon or spatula to spread the cream cheese instead of a knife. This post was originally published on August 9, 2015 and was updated on August 14, 2017. This post was originally sponsored by Smart & Final. Similar to this Rainbow Pinwheel was served at a high school art exhibit. Theirs featured olive and pimento. Afterward, I searched online and found your recipe. Thanks! How long will these be good for if I make them ahead? You can make them up to 8 hours in advance! These look delicious and easy to put together. I’m going to make these for a St. Patrick’s day gathering using the “Rainbow and Pot of Gold” theme! Have done this several times for cocktail parties. Very much a hit. I used the Fiesta Ranch dry mix with the cream cheese. Absolutely love it, such an added flavor!! Make a few hours ahead and just roll , out on a plate, refrigerate and cut later. Works great!! Thank you for such a fantastic recipe! I wanted to make something vegetarian for a work staff meeting/potluck that people besides me would actually eat. The recipe was so easy, tasted delicious, and the pinwheels were a hit! First thing to get eaten as a matter of fact and coworkers raved about how delicious they tasted. 🙂 Thank you! So glad they were a hit! Thanks for reporting back! This recipe has it all: simple, healthy, filling, travels relatively well, and nice presentation. I made these while camping (precut the veggies and mixed ranch and cream cheese at home) and they were enough to satisfy 2 hungry campers after a 4 hour bike ride. I think the ranchy cream cheese might be the secret ingredient; they tasted way better than I thought they would. Thanks for posting this awesome recipe!! So glad to hear you enjoyed them, thanks so much for reporting back! I make these often when I need to bring an appetizer to a get-together. Easy, tasty, healthy!